Why I want to read this: I so want to read this! I have had my copy for quite a while and cannot help but be curious what the backstory is and how the characters will deal with the consequences of their actions. In the ancient city-state of Gujaareh, peace is the only law. Upon its rooftops and among the shadows of its cobbled streets wait the Gatherers - the keepers of this peace. Priests of the dream-goddess, their duty is to harvest the magic of the sleeping mind and use it to heal, soothe...and kill those judged corrupt. Why I want to read this: N.K. Jemisin's books come highly recommended, and I seem to recall receiving it as a gift (although my memory may be spotty on that). I hope to read this someday! An emotionally riveting debut novel about war, family, and forbidden love—the unforgettable saga of two ill-fated lovers in Korea and the heartbreaking choices they’re forced to make in the years surrounding the civil war that continues to haunt us today. Why I want to read it: Korea is often in the news as is the turmoil in North Korea and refugees around the world. Crystal Hana Kim's novel calls to me, and I want to know more about the characters she has created and the story she has to tell. And what a gorgeous cover, don't you think? Why I want to read it: I have only read one of Kearsley's books to date, but I fell in love with her writing and eventually would like to try more of her work. I just love the sound of this one! Have you read any of these? Do any of these appeal to you? All these books sound so intriguing. 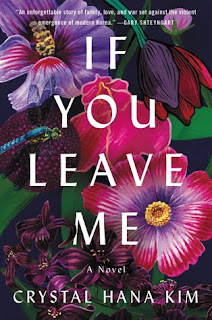 And I love the cover of "If You Leave Me"; what a colourful cover! Melody - It's a beautiful cover, isn't it? It really draws my eye to it. You have some great picks. I especially like the sounds of If You Leave Me. Jenea - Thank you! I am especially looking forward to If You Leave Me. I hope you enjoy The Light Between Oceans. I loved that book when I read it. If You Leave Me sounds like such a timely read. This bit of the synopsis really grabs my attention and makes me want to read the book: "a heartrending exploration of one woman’s longing for autonomy in a rapidly changing world." 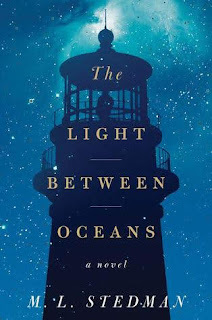 Suzanne - I hope I will love The Light Between Oceans too. I have heard such wonderful things about it--and am glad to hear you loved it. Hopefully If You Leave Me will live up to my expectations. I hope you like it too if you give it a try! I read your "old" choice and saw the movie based on the book. Both were good. Your new picks look promising--I've got ARCs of Bellewether and If You Leave, which I am excited about. Catherine - I had forgotten there was a movie based on The Light Between Oceans. I haven't seen it yet--maybe after I read the book. :-) I hope we both end of loving the new books! I have not read any of these, but I noticed Belleweather recently. I've meant to read a book by Susanna Kearsley for a long time. Kay - I really enjoyed the one book by Kearsley I have read. She seems to be a well liked author. I hope you are able to give her a try someday! The Light Between Oceans is so good! Sarah - It does sound like an heart breaker--some of my favorite books are. :-) I do want to read The Fifth Season by Jemisin as well someday. I've heard great things about it. Wow, If You Leave Me has such a pretty cover. I've always been curious about The Killing Moon and just made the connection that it's the same author as The Fifth Season. Barb - I really like the cover of If You Leave Me as well. Jenclair - I haven't yet read any of her books yet. I need to. I have The Fifth Season on my TBR shelf too. Wow! Lots of great books here! Great picks! I love that beautiful cover on If You Leave Me. 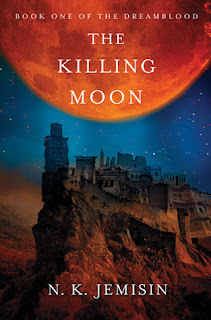 And The Killing Moon looks like a good fantasy- I'm kinda short on fantasies lately, and I've heard Jemisin is really good too. Greg - I really like that cover too. I've been hearing good things about Jemisin for awhile now and want to give her books a try. Stedman and Kearsley yes! the others are new to me. Mystica - I am excited about both of those. I just need more time to read everything! 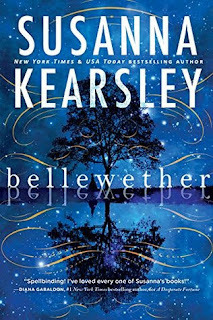 Oooh Bellewether sounds good and I love the cover! I want to read the new Kearsley, too. Her books are awesome. And I've read The Light Between Oceans. It's well-written and I liked it for the most part...I just thought the ending was really sad. Lark - I can't wait to read more by Kearsley. I love her writing. La La - I think so too! Wendy, I am SO drawn to lighthouses. That and THE KILLING MOON definitely appeal to me. Have you been able to start any of these books? Donna Marie - I haven't started them yet, no. I am a big mood reader and they just haven't won out over the other books on my TBR pile yet. Someday.